"Recipient of the 2015 Student Art Fund Purchase Award"
Digital photograph by Irina Wirjan '15. 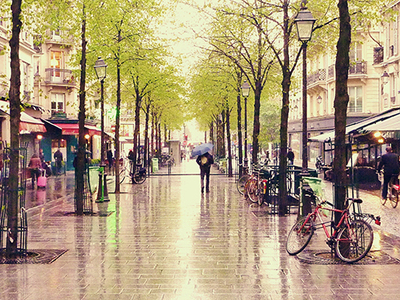 "I took this photograph in a split second as I was rushed by my tour group in Paris. Losing track of time exploring the local area, I wanted to take a symmetric picture of the street because it looked romantic in the rain."